Just as the ration card and the armband personalize the largest, most all-encompassing war in human history—telling the story from the ground up, as it were—the 85 Castañé photo albums were compiled by the men involved as memoirs to be viewed later by themselves and, presumably, their families and friends. The albums are informal; most lack captions or any type of identifying information regrading the compiler or the locations documented, which are chiefly battle sites. For the most part, however, the context of the photographs, along with the occasional shot of a well-known landmark, can give us a general sense of the place and circumstances in which the compiler found himself. 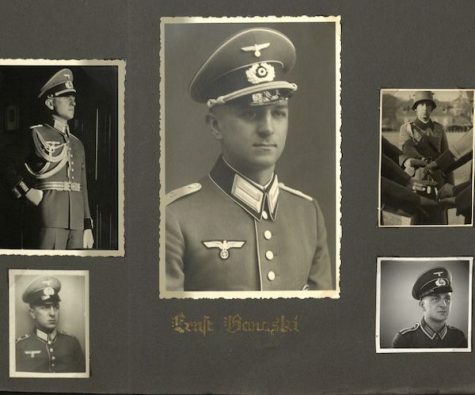 In the case of the album made by Ernst Banaski of the German Wehrmacht (Volume 64; Identifier MS Span183; Castañé document number 4248), we are more fortunate. Banaski was a lieutenant in his mid to late 20s, assigned to an infantry unit active chiefly on the Eastern front circa 1941 – 42. 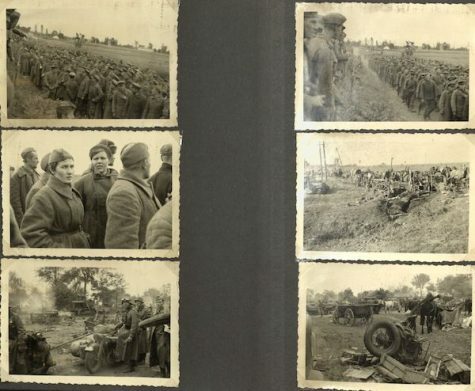 In his photo album he clearly identifies himself, along with many of his comrades and the places through which they moved and fought. 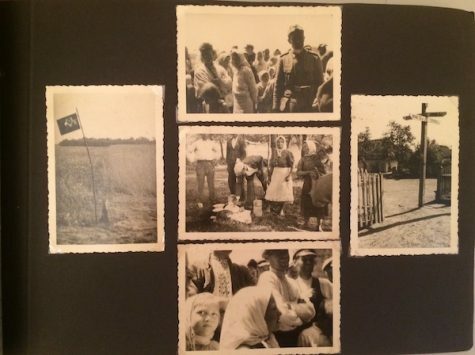 Although he was an officer, Banaski put his photos in an inexpensive, commercially produced binder. 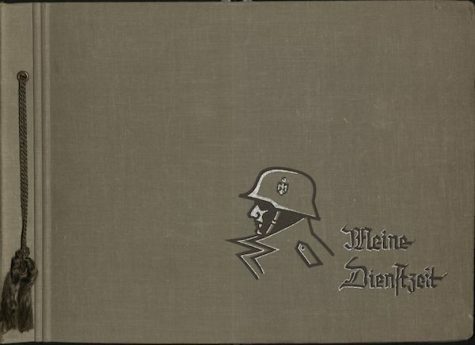 It is stamped on the cover with the standard words “Meine Dienstzeit” (“My Service Time”) and is one of the thousands produced for the German military to document their wartime activities. 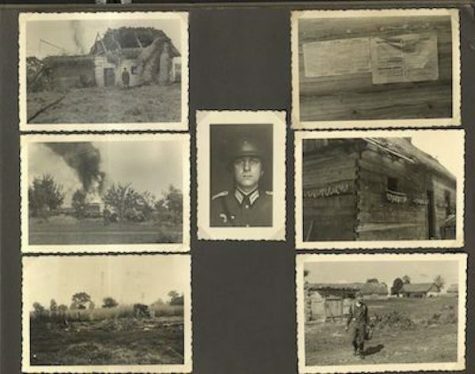 The Castañé collection contains a few dozen albums with binders such as these, as well as similar ones marked “Kriegserinnerungen” (“War Memories”). The design and titles of these binders convey the subtextual assumption that a) Germany would ultimately be victorious, and b) the compiler would be sure to survive and be in position to look back on his experiences fondly. Thus, the albums served as an effective morale-booster—that is, a propaganda tool. 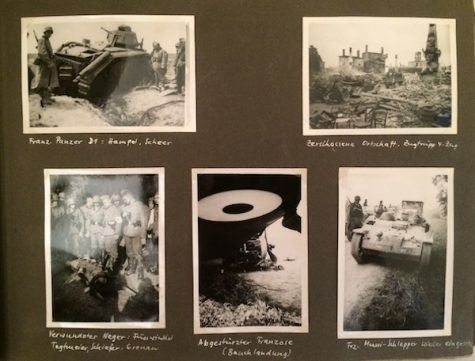 We first find Banaski in the field in what appears to be France during the “Blitz Krieg”: we see shots of destroyed French planes and tanks; a wounded soldier surrounded by onlooking Germans; devastated villages and combat scenes. Then, with no description or captioning by Banaski, the action shifts, and we notice civilians in what appears to be traditional Eastern European dress and signs in Ukrainian. There is much less actual fighting documented in these pages, and Banaski and his comrades appear to be interacting in a friendly manner with the local populace. This makes sense: during the Second World War, the Germans were initially welcomed as liberators by many western Ukrainians, who suffered under Stalin’s collectivization. Indeed, at that time there were several hundred thousand inhabitants of Ukraine, mostly descendants of settlers, who were considered “ethnic Germans” (Volksdeutsche) by the Nazi administration. However, the Germans wasted whatever good will the local populace might have held by preserving the Soviet system of collective farming, propagating their genocidal policies against Jews, transferring many Ukrainians to do forced labor in Germany, and in general attempting to empty the country in advance of planned colonization. As the album goes on, we see the fighting become heavier, with pictures of casualties, prisoners taken, and destroyed materiel. 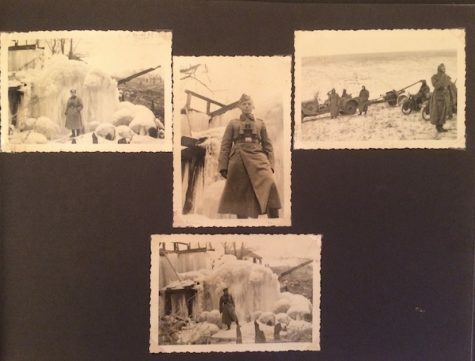 The last pages show Banaski and some comrades in a frozen landscape, with mountains of ice covering structures and equipment; these scenes presage the war’s outcome, known so well to us all. I’ve done a bit of research into Banaski’s postwar career but have been able to find almost nothing, not even a death date. It’s even possible that he’s still alive, although he’d now be about 100 years old. He’s mentioned as having matriculated at the University of Bonn in 1948-49, possibly under a different name, and he appears to have authored a work entitled Die Agrargeographie im Triasland beiderseits der unteren Kyll, published in 1949, perhaps as a thesis or dissertation. To me, Banaski’s album perfectly encapsulates the moral grey zone that many ordinary Germans—soldiers and civilians—must have found themselves occupying during the Nazi era. Compared to other examples of albums in the Castañé collection, Banaski’s is noticeably lacking in expressions of Nazi ideology, jingoism, or triumphalism. My sense—admittedly subjective—is that he probably came from a petit-bourgeois background and had had at least some university education by the time the war started. He was officer material, but only of middling rank. 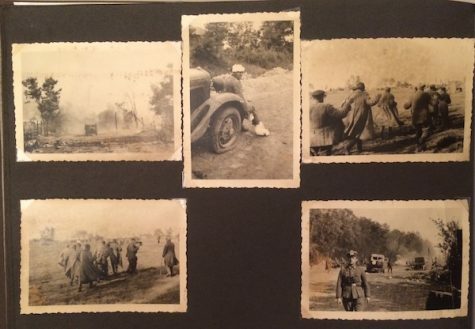 The photo album he left behind is only one fragment from the entire mosaic of what was his life; we don’t know what else he did (or did not do) during the war, nor do we know how he personally felt about the regime he served. We who come after him have no access to his inner moral universe, only that his destiny was to be caught up in a world-historical project of pure evil. What can we learn from the case of Ernst Banaski? Is there anything there that can help us with the psychological, philosophical, and political quandaries that bedevil our time, particularly the rising tides of nationalism and xenophobia? If a country as “civilized” as Germany could fall to fascism as quickly and as thoroughly as it did under Hitler, could it happen again somewhere else? Personally, I fear that it could. We could, any one of us, one day find ourselves standing in the shadow of a tank, in the snow, on the wrong side of history. We are all Banaski.